After your braces are taken off, there is a possibility of relapse. Your teeth will have a tendency to return to their original positions. To prevent this from happening, orthodontists recommend wearing an orthodontic retainer. There are various kinds of retainers. Some are fixed—they are bonded or cemented to the teeth. The most common type are removable, like the Hawley appliance pictured on the right. How long should you wear it? Until there is no more chance that your teeth will move. Your orthodontist will recommend a period of time. But sometimes their estimates are inaccurate, and the best gauge is your own teeth. 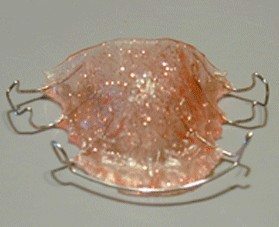 If you retainer has been out of your mouth for, say, two days, and you try to put it back in, you’ll be able to tell if your teeth moved in the meantime. If they have, it’s too early to go without it for that period of time. Wait a week, or a month, or longer, and try to put your retainer back in. Did your teeth move? If so, keep wearing it. My recommendation is to keep wearing it at least nightly until there is no more movement in your teeth.